ALLENTOWN, PA (Sept. 13, 2017) – Mack Trucks today introduced its new, next-generation highway hero, the Mack Anthem™, during the Mack Global Dealer Summit in Allentown, Pennsylvania. 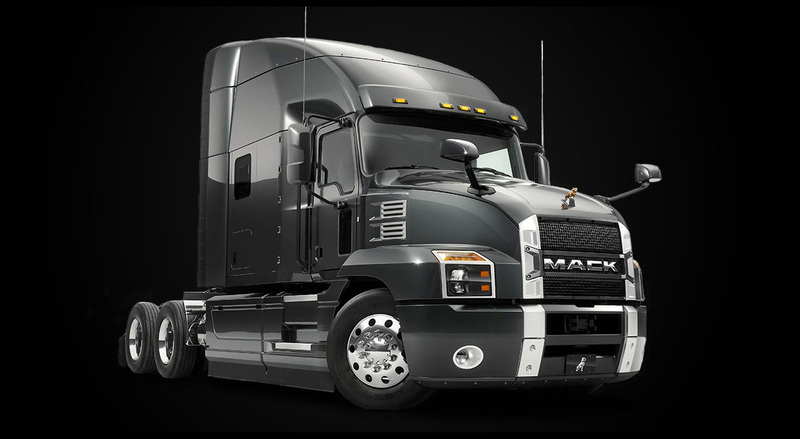 The Mack Anthem is a re-engineered, redesigned and reimagined interpretation of what today’s highway truck should be – aerodynamic, comfortable and connected, all with a distinctively bold Mack look. The Mack Anthem gives drivers and businesses the tools they need to command the road. With a bold grille and prominent Mack wordmark, the Anthem features an all-new exterior design with optimized aerodynamics for improved fuel efficiency. New driving and sleeping environments were crafted with an emphasis on increasing driver comfort and productivity. The Anthem is available in several configurations, including a Day Cab, an all-new 48-inch Flat Top Sleeper, and an all-new 70-inch Stand-Up Sleeper. With its chiseled, muscular looks, the Mack Anthem makes a clear statement. Yet despite its chiseled appearance, the Mack Anthem’s new aerodynamic enhancements improve fuel efficiency by up to 3 percent. In addition to a new hood and grille, Mack engineers redesigned the roof and chassis fairings, mirror covers, and front bumper and air dam to more easily cut through the wind. The Anthem’s redesigned hood and bumper not only improve aerodynamics, they also help cut service time. Both feature three-piece construction for improved serviceability in the event of damage. A new hood latch and release system also saves drivers’ time during pre-trip inspections. A central latch release below the grille eliminates the need for drivers to walk from side to side to tilt the hood. The hood also requires 50 percent less effort to raise than before. All exterior lighting on the Anthem is now exclusively LED, meaning brighter, longer-lasting lights that draw less energy. The change to LED is most noticeable on the Anthem’s headlights, which are 66 percent brighter than today’s bulb. The new LED headlights improve nighttime safety by casting a wider beam down the road and producing a whiter light to better illuminate objects. The Mack Anthem features an all-new driving environment that incorporates driver feedback for improved functionality, ergonomics and convenience. 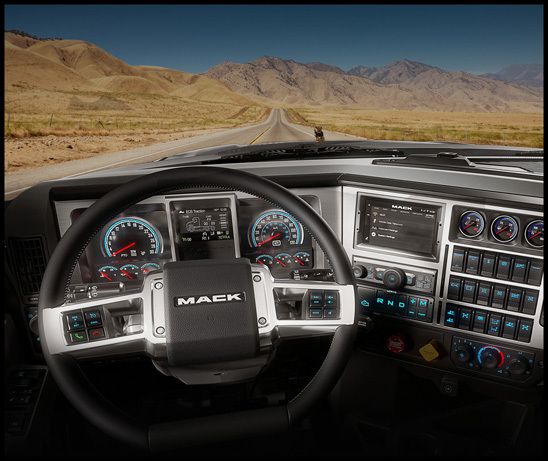 Gauges on the instrument panel have been positioned higher for better driver visibility, while HVAC controls and the Mack mDRIVE™ automated manual transmission (AMT) shift pad have been relocated closer to the driver’s fingertips. All switches for additional truck functions like cruise control, PTOs and traction control now feature laser etching to help maintain markings over the long life of the vehicle. Inspired by racecar controls, a new flat-bottom steering wheel is a Class 8 trucking industry first, providing improved dash visibility, as well as easier ingress and egress. The new steering wheel also contains illuminated controls for cruise control, Bluetooth and the audio system. Behind the steering wheel, Mack’s Co-Pilot™ display has been updated with a new 5-inch, full-color screen for improved visibility and more intuitive navigation. Co-Pilot provides drivers with a convenient way to monitor vehicle information, including engine and oil temperatures, trip odometers, aftertreatment status, tire pressures and more. A Pre-Trip Assistant guides drivers through inspection points and includes a single person exterior light inspection mode. Anthem models are available with a new information and entertainment option featuring a 7-inch touchscreen display giving drivers safe access to Apple CarPlay, satellite radio, weather band radio and TomTom truck navigation. The display is also compatible with third-party back-up camera systems. New Mack-exclusive seats are available, providing all-day comfort for drivers. Designed in partnership with Sears Seating, more than 30 feature and fabric combinations are available, including an optional swivel base. The Mack design team’s attention to detail is also reflected in the Anthem’s sleeper, resulting in a spacious, comfortable environment for drivers. The all-new 70-inch sleeper now features stand-up height for even tall drivers to easily walk-through the cab into the living environment. The interior volume of the new sleeper is 35 percent larger than previous models. Anthem's 70-inch Stand-Up Sleeper models are available in single or double bunk configuration. Redesigned back wall and side cabinets provide unparalleled storage space. Multiple configurations are available, providing up to 27 cubic feet of storage space for drivers, the most in the industry. A Mack-exclusive under-bunk storage system offers three additional illuminated storage trays which lift for access to a luggage compartment. Optional comfort features include a television prep kit that can accommodate up to a 24-inch flat screen and a drawer-style refrigerator mounted on the passenger side. Windows in the sleeper feature aircraft-inspired shades for superior light control, while integrated screens keep insects out. A new sleeper environment control module centralizes controls for HVAC and auxiliary power units, while also offering a convenient 120-volt outlet and USB power. New high-power premium sound packages are available as well and include a powered subwoofer. As with the exterior, all lighting inside the Anthem is LED-based for long life and brighter light. Overhead dome lamps combine with task lighting to illuminate the sleeper space. Ambient floor lighting is standard inside the sleeper, while wash lights illuminate the instrument panel and cup holder area. Both feature red light, which does not compromise nighttime vision. Mack’s legendary integrated powertrain gives the Anthem the performance drivers need to accomplish any over-the-road task. Proven, efficient power from Mack’s 2017 MP® series engines combines with industry-leading Mack mDRIVE™ automated manual transmissions and Mack axles to deliver power and efficiency without compromises. The Anthem is available with the 13-liter Mack MP8 engine producing up to 505 horsepower and 1,860 lb.-ft. of torque depending on spec. Several enhancements to improve efficiency and productivity are included, such as a patented wave piston design that enables more complete fuel combustion and a common-rail fuel system to more accurately control fuel injection. The 11-liter Mack MP7 is also available as an option on the Anthem. With up to 425 horsepower and 1,560 lb.-ft. of torque, the MP7 gives customers a powerful choice for weight-conscious applications. Both engines share a number of additional enhancements to improve serviceability and reduce maintenance needs, including a two-piece valve cover, shimless rockers and a low-pressure fuel system with an enhanced, integrated aftertreatment dosing module. An updated, double-walled EGR flow sensor helps reduce condensation and soot buildup in cold weather, while a new intake throttle enables a faster warmup when the engine is started. Mack’s SuperEconodyne downspeeding packages are available with both Mack MP7 and MP8 engines. Thanks to the complete integration of Mack’s engines with the mDRIVE AMT, SuperEconodyne enables a lower cruise rpm to help save fuel. Available exclusively with SuperEconodyne is the Mack MP8-TC engine. Featuring turbo compounding, the Mack MP8-TC captures and converts waste energy from the exhaust into mechanical energy that is fed back to the engine. The turbo compounding system feeds up to 50 additional horsepower back to the crankshaft, enabling additional performance while improving fuel efficiency. Combined with the Anthem’s aerodynamic improvements, the Mack MP8-TC engines provide up to an 11.8 percent improvement in fuel efficiency compared with a baseline from previous Mack models equipped with GHG2014 engines. Mack’s 12-speed mDRIVE AMT is standard on all Anthem models. Fully integrated with Mack MP engines, the mDRIVE uses sensors to detect speed, load, grade and more to ensure the right gear and shift points are selected for conditions. The mDRIVE also eliminates traditional shifting, helping reduce driver fatigue and allowing the driver to remain focused on the road. It also helps with driver recruitment and retention because of its ease of use. Mack’s reinforced and ruggedized mDRIVE HD AMTs are available as an option on all Anthem models. With stronger, more robust internal components, the mDRIVE HD is designed to handle the more frequent shifts that heavy loads can bring. Additionally, mDRIVE HD 13- and 14-speed variants are available, which add one or two low-ratio creeper gears. This enables the Anthem to act as two trucks in one, providing the startability and low-speed maneuverability needed for heavy loads, while allowing for lower rear axle ratios for fuel efficiency at highway speeds. Bendix Wingman Fusion, a camera- and radar-based driver assistance solution, comes standard on all Anthem models. Fusion provides collision mitigation, adaptive cruise control and lane departure warning, assisting drivers in staying safe on the highway. Mack also introduced Mack Connect. Mack Connect will serve as the reference for Mack’s growing connectivity and uptime service offers. With Mack Connect, current and future services will be structured under connected support, connected business and connected driving. Using predictive analytics and connective technologies, Mack Connect turns data produced by the truck, the driver and the service process into insights and actions, resulting in superior support and service to Mack customers. Under Connected Support, Mack GuardDog® Connect, which proactively monitors truck performance on Mack models, is Mack’s integrated telematics service. Should a potential issue be detected, GuardDog Connect automatically notifies Mack’s 24/7 OneCall® staff at the Mack Uptime Center. OneCall agents determine the severity of the issue and provide the customer’s designated contact with decision-critical information through Mack ASIST, an online communications and service management portal. If service is required, the closest dealer location is identified and service bay space and parts availability is confirmed, all while the truck is still on the road. Mack Over The Air (OTA) is another uptime feature recently announced by Mack. Over The Air allows remote updates for software and other parameters on the customer's schedule. Without the need to schedule a service appointment, Mack OTA helps increase productivity and uptime for drivers. Under Connected Business, GuardDog Connect can send vehicle data directly to Mack’s fleet management partners. This allows customers to choose fleet management software that works for their business, without having to rely on third-party hardware installations. For Connected Driving, Anthem’s information and entertainment options, including Bluetooth connectivity, satellite radio and Apple CarPlay integration, allow drivers to focus on the road. Additional applications such as navigation can be downloaded. Also available on mDRIVE-equipped models is Mack Predictive Cruise, an intelligent system that memorizes route to help improve fuel efficiency by up to 1 percent. When cruise control is on, Mack Predictive Cruise learns the topography of the route and stores up to 4,500 hills in its memory. The next time the driver travels the route, Mack Predictive Cruise engages the industry-leading Mack mDRIVE to employ an optimized shift strategy and choose the most fuel-efficient gear. The Mack Anthem is available for order now, with full production beginning in Q1 2018. For more information, please visit www.macktrucks.com or your local Mack dealer.